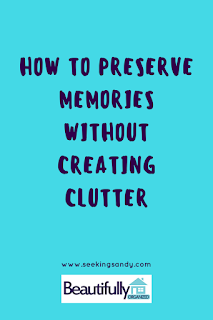 I am going to do a series on cutting clutter. Specifically in relation to "special" items. 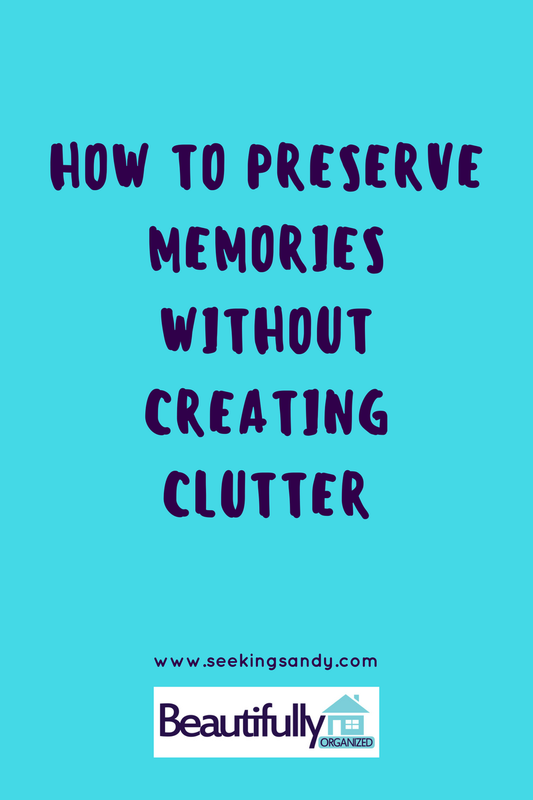 I have a few tips that I feel work really well for us, that I want to fill you in on because lets be honest, we all have some clutter to cut! Especially when we have kids, right? I am so big on having the memories to look back on, but I don't want it taking up tons of room in my house. I think because I started in such a small house, I became very practical and creative on how to do both! 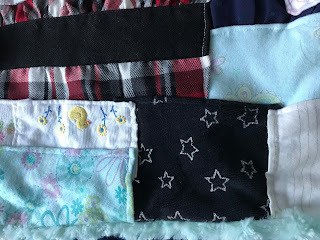 This week I want to share one thing I did/do for my kids that helped me to cut clutter when it came to saving their stuff. Specifically clothes, blankets, etc. What do you do with the clothes that your kids grow out of? 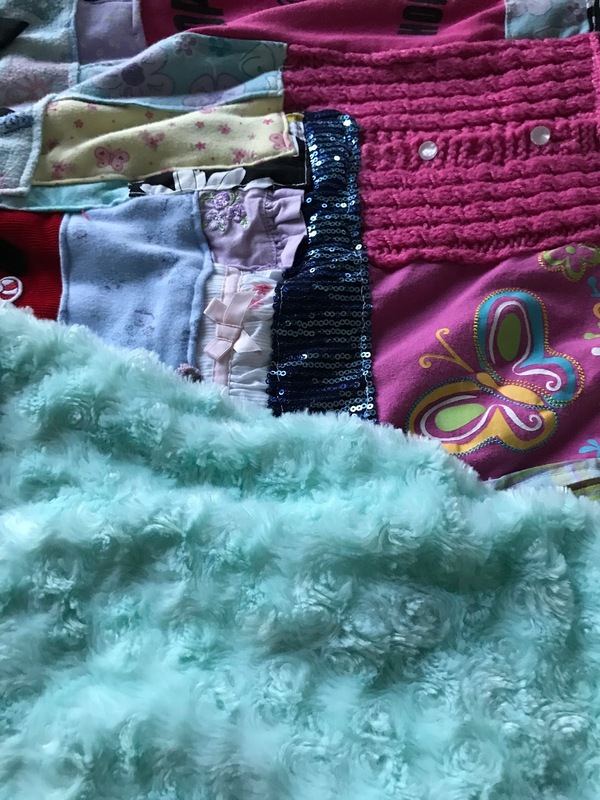 Or special things like blankets that the kids had but, no longer use? My system has been to go through the clothes and separate into piles. Donate/consign, trash and special. 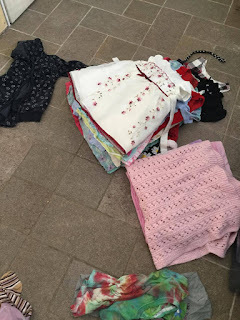 I have friends that have younger kiddos than I do, so most clothes get passed on to them. Occasionally, I will bring some stuff to the local consignment store. Some clothes, are so stained from play that I throw them away...kids, right?? 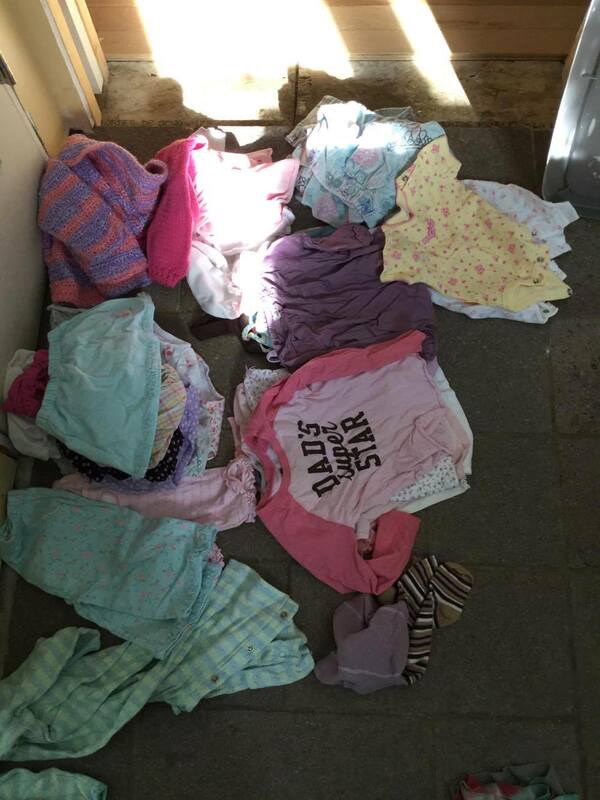 Special items get placed in a bin that I store for each child in the basement. What goes in special for me? Well, holiday outfits, special t-shirts from events or that say something I want to remember, special event outfits such as first day of school, parties, or just stuff that I thought was so cute and couldn't get rid of. In this bin are also some baby shoes, blankets and a few cute things from childhood. I realized last year that I hadn't really been saving any of Olivia's clothes anymore. She had outgrown the stage where things were cutesy, and I had stopped making a big deal out of brand new outfits for holidays. A lot of what I would buy for holidays were outfits that could be worn again, so they held less significance. I knew since she was young that these special items were going to end up in a quilt someday, and I decided that last year it was time. Her bin was full and I brought everything out and went through it. 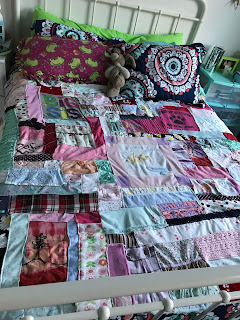 The only thing I kept was her coming home from the hospital outfit in the bin, but I brought all the other clothes and blankets to a quilter who made me the most wonderful blanket filled with so many memories. Isn't it amazing? I am all about giving my kids stuff from their childhood someday, but do they really need a bin of cute clothes?? No, but was it hard for me to part with some of these things, yes. So this was a perfect solution and you know what?? Olivia LOVED it. LOVED it. I knew she would like it, but I thought she wouldn't really grow to appreciate it until she was older, but I was so wrong. She was so sweet about it and you could tell how much she loved it. She leaves it on her bed and uses it every night! So much cuteness and wonderful memories put into something that is useful as well as beautiful. 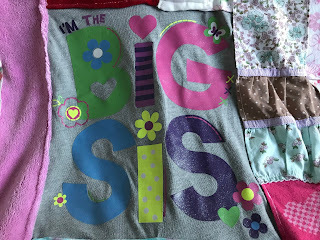 I picked out a really pretty, really soft material for the back of the quilt that made it not only cute, but super cozy as well!! 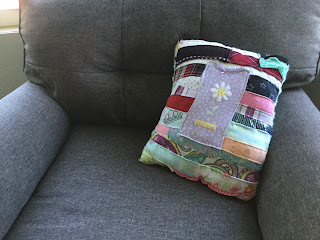 Then with the scraps she made a throw pillow for me, so now I have a piece of the memories as well! I keep it right on my chaise and just love it! 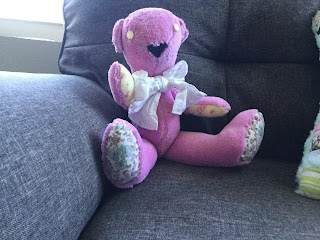 And with more scraps and one of Olivia's blankets she made me a stuffed animal that someday I could give to my grandkids (not that I want to think about that quite yet) to have their special stuffy made with Olivia's memories! 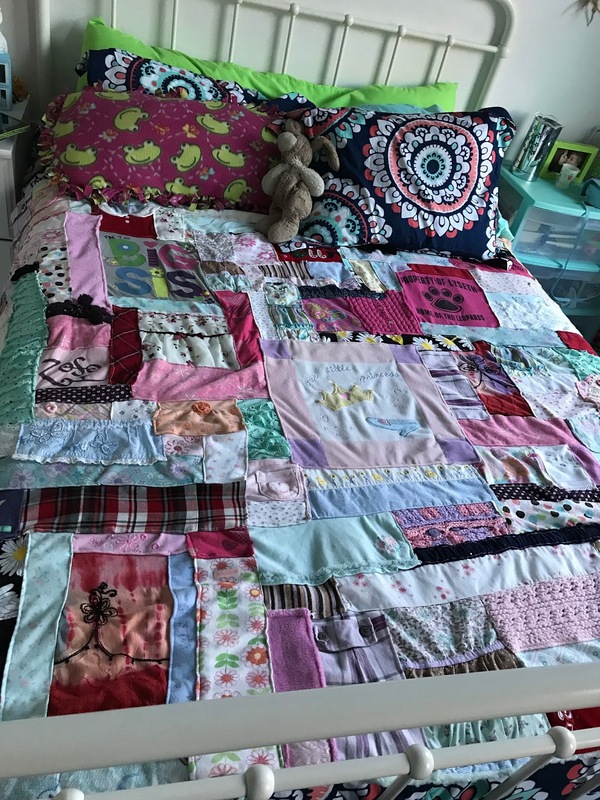 This was made with one of her favorite blankets and buttons and bow from her first communion dress. The ears and paws are made from some other special dresses! How special is this bear? ?